Before you call, Read over the following to see if you need to. the energy efficiency of the units they don’t get as hot as they once did. The heat was what dried the dishes and still does just not as good. They need help to keep from spotting up your dishes. If you buy the soap packets with rinse aid you do not need to put rinse aid into the door dispenser. That could cause new problems. Check your filter. 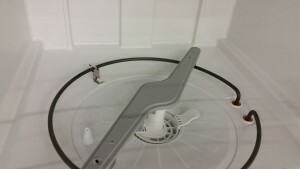 There is a filter or a strainer in the bottom of your unit. It is there to catch food or broken glass, toothpicks, coins, screws, I’ve seen it all. Check and clean the filter on a monthly basis. Spray arms will catch anything that gets past the filter and will clogged up the little holes and keep the spray arms from spinning. If you see anything blocking the holes in the spray arm clean it out. Cold water will not clean your dishes. Soap cannot dissolve in cold water. Run the water in the sink next to the unit until it is hot then turn on the dishwasher. There is a lot of cold water in the line going to your dishwasher. Run a cup of vinegar either by itself or with your dishes to clean your dishwasher. It will bring out the shine on your glassware. 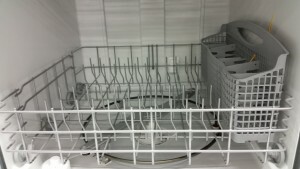 If you are getting a lime or a chalky type of build up on the heater coil or spray arms use CLR to get it out before it turns your dishwasher into a dish cabinet. A Standard 115 volt wall outlet can easily carry 150 times the current needed to kill a person.